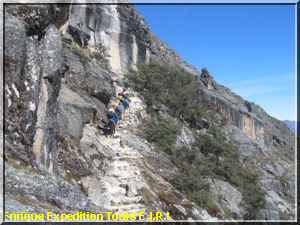 CLIMBING HUASCARAN MOUNTAIN TREKKING CEDROS ALPAMAYO PERU 2019, specialized in the Organization of Climbing Huascarán Mountain Cedros Alpamayo Trek Huaraz Perú South America 2019, operators have a team of professional work experience in the field of tourism of high mountain, whose main objective is to provide quality, safety and warranty on all of our services, in this way, meet the expectations and demands of the customer. 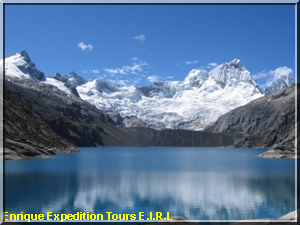 We will help you to organize your Tours program in bus, conventional Tours, Trekking, Climbing, hiking, climbing in the Cordillera Blanca and Huayhuash ice as well as in Cusco - Arequipa - Puno - Huaraz, Peru. 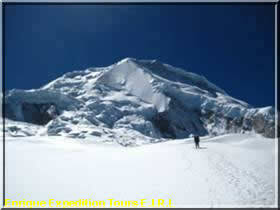 - Start trekking or Climbn : Lima – Peru – South América. Day 1. - Country of origin to Lima, stay at hotel. Day 2. 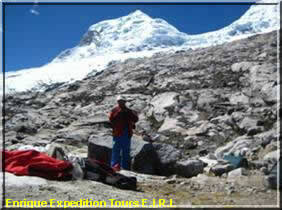 - Lima to Huaraz, the capital of Ancash department (3,090m) by bus (8 hours), stay at hotel (Bus Cruz del Sur). Day 3. 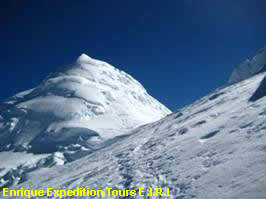 - Acclimatization trek to Lake 69 (4,400m). 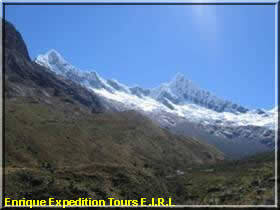 We leave Huaraz heading north, at kilometer 55 we arrive at the city of Yungay. From there we drive by taxi to the lakes of Llanganuco. A bit later we arrive at Cebollapampa (3.900m). From that place we start walking for about 4 hours until the Lake 69. 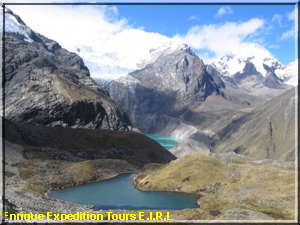 The lake offers a beautiful view to the summits of the mountains Huascaran, Chopicalqui, Pisco, Huandoy, Yanapaccha and Chacraraju. We stay at the lake for one hour before we return to Cebollapampa. From there we drive back to Huaraz - Hostal. Logistics and preparing the technical gear for the expedition. 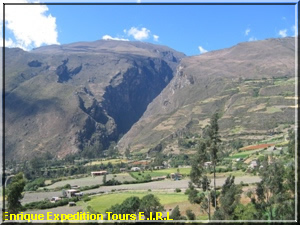 Day 4.- Huaraz (3,100m) – Hualcayán ( 3,139m) – Wishcash (4,400m). Breakfast at 6.30 a.m. 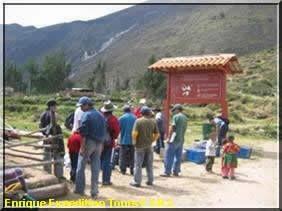 Transfer from Huaraz to Hualcayán by private bus. At Hualcayán we visit archaeolocigal ruins (f.e. 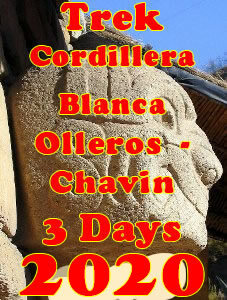 graves of stone which are called chullpas) of the pre-inca-time before we walk to Wishcash. Camping. From here we can see the summits of Milhuacoch and Rajucocha. Walking-time about 5 hours. Day 5. - Wishcash - Osoruri (4,850m). We leave Wishcash at 8.00 a.m. We reach the lake of Cullicocha (4600) and pass our first pass of Cullicocha (4850). Enjoying the view at the summits of Santa Cruz and Millhuacocha. Walking-time about 6-7 hours. Day 6. - Osoruri - Jancarurish (4,250m). 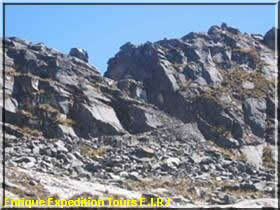 We pass the second pass of Cedros (4750), crossing the mountain ravines of Cedros and Alpamayo. Then we visit ruins (built like circles), agriculture terraces, which belong to the culture of Recuray. We have a nice view to the summits of Millhuacocha, Pilanco, Pumapampa, etc. We continue our walk until we reach Jancarurish. From here we can enjoy the view to the top of the Alpamayo, which is nominaed to the most beautiful mountain of the World.Walking-time about 6-7 hours. Day 7. 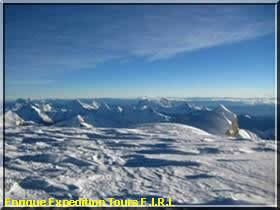 - Jancarurish (4,250m) - Huillca (4,000m). 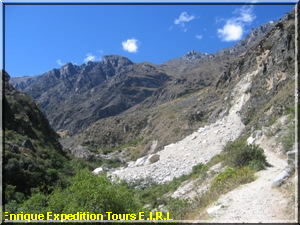 We follow the foothpass through farms and pass the third pass (Cara Cara 4.836m) before we descend to the mountain ravine of Moyobamba. Now we pass the 4th pass (Tayapampa (4500)) and descend to the mountain ravine of Tayapampa. Camping at Huillca. Walking-time about 7-8 hours. Day 8. - Huillca (4,000m) - Jancapampa. (3,400m). Walk through the ravine of Yanta Queñua. Passing the 5th pass of Yanajanca (4600). Enjoying the view to Pucahircas. Camping at Jancapampa. Day 9. - Jancapampa. (3,400m) - Carhuacasha (3,950m). We descend the ravine of Pingospampa and pass the 6th pass ahich is called Tupa Tupa (4400) Walking-time about 6-7 hours. Day 10. 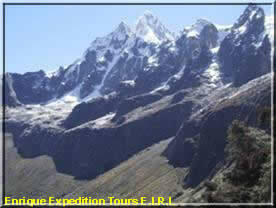 - Carhuacasha (3,950m) - Tuctubamba (4,300m). We observe the lake of Huecracocha and the Glaciar de Taulliraju. 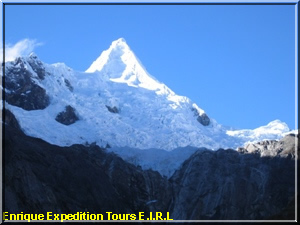 Now we pass the 7th pass (Pucaraju (4650)) and enjoy the view to the summits of the Cordillera Blanca, f.e.Taulliraju, Chacraraju Pirámide de Garcilazo Paria etc. 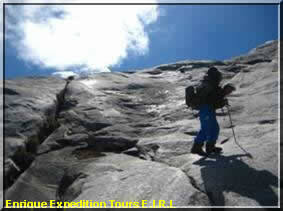 We descend until the camping-site of Tuctubamba (4300). Walking-time about 6 – 7 hours. Day 11. - Tuctubamba (4,300m) – Taullipampa (4,250m). Pucajirca, Rinrijirca, Quitaraju, Santa Cruz, Artezonraju, Paria, Pucaraju and the mountain ravines of Santa Cruz and Morocoha. 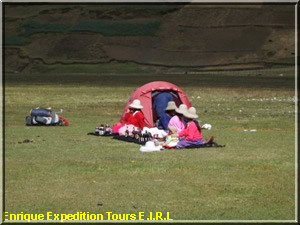 After two hours walking we arrive at our camping of Taullipampa at a altitude of 4250 m.
Day 12. - Taullipampa (4,250m) – Llamacorral (3,760m). 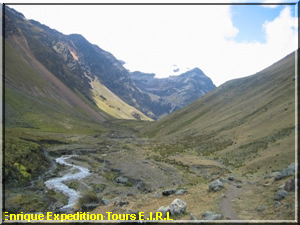 Today we walk to the east-site of the Alpamayo. We descend until the mountaine ravine of Santa Cruz with a view to the lakes of Jatuncocha (3900) and Ichiccocha (3850). One hour later we arrive at our camping-site. Day 13. 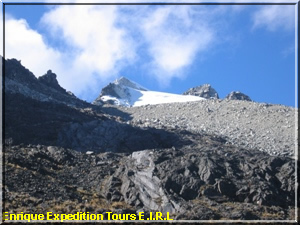 - Llamacorral (3,760m) – Cashapampa (2,900m). We descend the small mountain ravine of Santa Cruz to Cashapampa. This will take us about 4 hours. From Cashapampa we return to Huaraz. Day 14. - Day of rest in Huaraz. 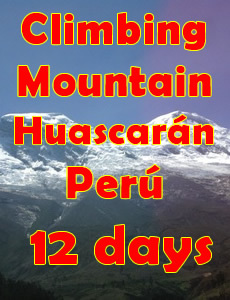 Day 15.- Huaraz base camp to Huascaran base camp (4,100 m). 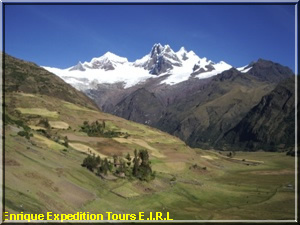 We reach the village of Mancos ( 2.530 m) by car and then ascend 20 kilómetros by road to the village of Musho, located NE of Huaraz, at the base camp of Huascarán (4,100m). Day 16.- Campo base Huascarán – C1 (5,500m). From base camp, on the upper part of the moraine, we reach the edge of the glacier and continue towards the serracs, setting up camp 1 at 5,500m. 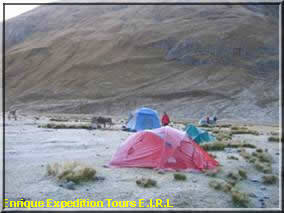 Day 17.- Campo 1(5,500m) - Campo 2 (6,000m). Climb to camp 2 (6,000m), through the section called the channel, where we cross a few crevasses, and reach the “bottleneck”. Day 18. 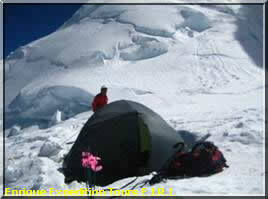 - Campo 2 (6,000m) – Summit Huascarán S (6,768) - camp 2 or camp 1. Climb a couloir (65-70º) that reaches the upper part of the “bottleneck” (6,010m), and then traversing a few gentle slopes, and reach the summit at 6,768m. Return to camp 2 or camp 1. Day 19. – Campo 1 – Campo base. 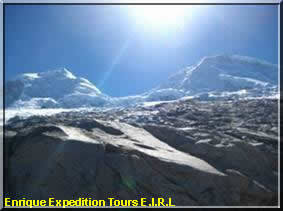 Descend to base camp of Huascaran and establish high camp. Day 20. 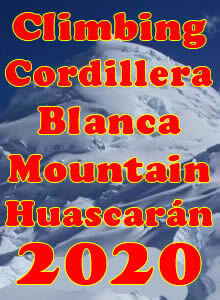 - Campo base – Musho – Mancos – Huaraz - Hostal. 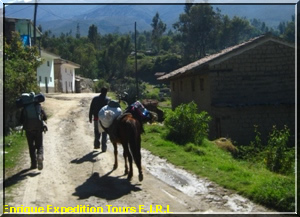 Descend from base camp to the village of Musho , where private transportation will transfer us back to Huaraz – Hostal. Day 21. - Huaraz to Lima, stay at hotel. Day 22. - Lima, transfers from hotel to airport. Return to country of origin. - When you arrive to Lima we pick up you to the hotel by taxi. 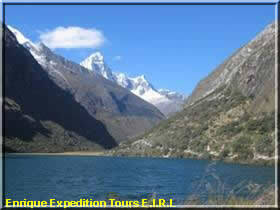 - When you arrive to Huaraz we pick up you to the hotel by taxi. - Bus transportation Lima – Huaraz. (Service VIP). 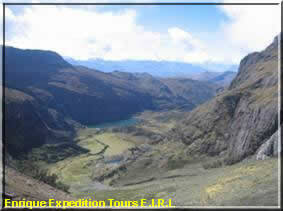 - Private local transportation Huaraz – Cebollapampa - Huaraz. 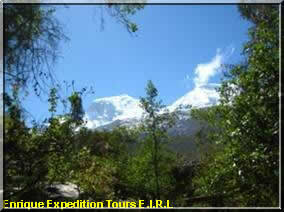 - Mountain guide (IUAGM) – Trekking – Climb. 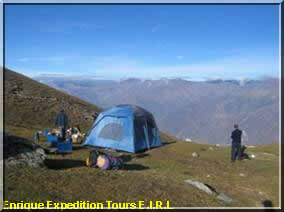 - Porters carry camping equipment (C1 – C2). 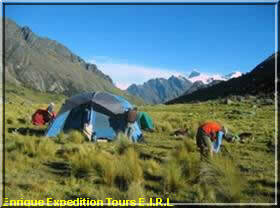 - Kitchen gear and cooking facilities at base camp (including dining tent, chairs, cooking tent). 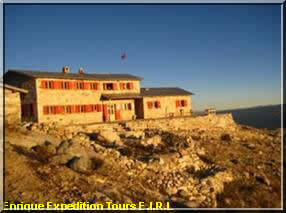 - Food for the whole duration of the climb (breakfast, lunch and dinner) is included. - Check-up for oxygen to assess acclimatization level of each client. - Entry to National Park Huascarán. 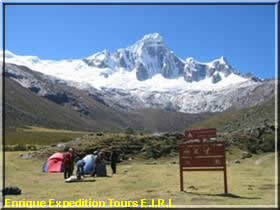 - This advance reservation is carried out 5 months before your arrival date to Huaraz. Lightweight walking shoes/sandals/socks/pants/short pants/T-shirts (long sleeve and short sleeve)/sunglasses/sunscreen/plastic bags/warm sleeping bag /light weight trekking boots/wool socks/light weight treeking pants/waterproof pants and jacket/fleece/Goretex/hat/mits or warm gloves/thermal liners/camera/bandana or hat against sun/headlamp with extra batteries. Glacier glasses 100% UV with rigid case (2 pair recommended)/ goggles/ sunscreen with maximum protection/lipbalm/4 season sleeping bag/ sleeping pad or thermarest/hat/thermal underwear/fleece jacket/fleece pants/down jacket/Goretex jacket or similar material/2 pairs of gloves or mittens/ pair of thermal glove liners/2 pairs of thermal sock liners/plastic boots/gaiters.